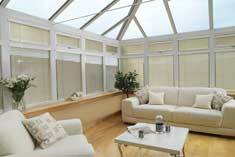 There are so many types of conservatory blind – what’s the difference? The choice of conservatory blinds can be confusing so here’s our handy guide to understanding the differences between the many different types of conservatory blind. We’ll help you to choose your best option when we come out to measure for an estimate and we’ll also show you our huge range of designs and colours. Our made-to-measure Vertical Blinds offer a stylish and cost effective solution for larger areas of glass such as conservatory sides, bi-fold doors and patio doors. They come in a broad range of quality fabrics and colours, many of which have a solar reflective coating for heat & glare control. Some can be matched to our beautiful pleated and roller blinds. 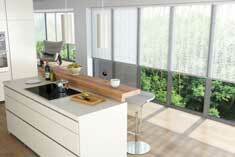 Our vertical blinds are available in 89mm (3.5”) or 127mm (5”) louvre widths. Our modern Venetian Blinds are practical, fashionable and offer great light control. They come in a stunning range of shades and surface finishes including pearlised, perforated, printed and wood effect. The horizontal aluminium slats are available in 16mm, 25mm, 35mm and 50mm, widths and have colour coordinated head and bottom rails to suit all types and styles of conservatory windows and doors. The Perfect Fit System is an elegant, no-drill blind fitting solution suitable for most conventional UPVC doors and windows. It sits flush within an all-around frame and the guide rails keep the blind close to the glass, making it perfect for tilt and turn windows, and back doors with narrow frames. The Perfect Fit System is compatible with 20mm pleated, 16mm/25mm aluminium, 25mm woodslat and roller blinds. Our 20mm Pleated Blinds are ideal for both rectangular and those tricky shaped panels often found in conservatory roofs. 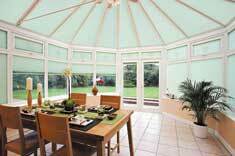 With solar reflective coatings, they offer the perfect solution to reducing heat gain and glare in your conservatory. All our pleated blinds are fitted as standard with Equipleat ® pleat retention system which ensures the pleats retain their spacing and your blinds keep their shape. Our pleated blinds take up little space due to the thinness of their top and bottom rails. They come in a wide selection of beautiful designs and colours, some of which can be matched to our roller and vertical blinds. Our traditional made-to-measure Roller Blinds offer a popular and cost effective solution for most types of conservatory window. These pull-down blinds come in a stunning range of patterns and shades and can also be ‘personalised’ by the addition of braid, poles or a shaped bottom edge. Available as spring, chain or electric option they are perfectly suited for conservatory side windows and when fitted with hold down brackets or side guide wires, they are ideal for conservatory doors and tilt/turn windows. Intu Design Blinds solve the problem of how to fit blinds to all types of conservatory windows but especially tilt & turn windows and conservatory doors. 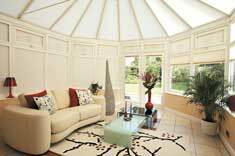 The discreet no holes fitting system will enhance the look of any conservatory without the need to drill holes for screws. 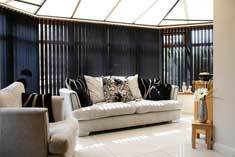 Intu Design blinds can be supplied with either slim Venetian slats (16mm/25mm), pleated blinds (20mm) or roller blinds. 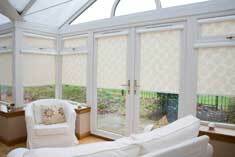 Panel Blinds work well in conservatories with large expanses of floor to ceiling window or patio doors. 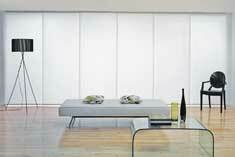 Made-to-measure panel blinds also make practical and stylish room dividers. Extended, they provide shading or privacy. Alternatively they stack behind each other effortlessly to allow maximum light into your room. Marla Custom Blinds supply panel blinds in a range of modern fabrics including solar reflective, woodweave and faux suede. 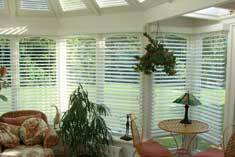 Wood Venetian Blinds offer a natural alternative to our aluminium Venetian blinds. They complement modern, natural wood flooring perfectly and come in a vast range of natural wood tones plus white and Dulux colours. 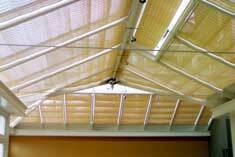 The slats come in 25mm, 35mm and 50mm widths to suit most window styles. They come with a matching pelmet and can be supplied with optional ladder tape to add that extra touch of luxury. Woodweave Blinds offer the last word in contemporary style producing a subtle, diffused lighting effect that is both stunning and soothing. They are made using the same system as our 20mm pleated blinds, which means that they are ideal for vertical windows, Velux windows, and conservatory roof panels of all shapes and sizes. We offer an exceptional range of beautiful woodweave fabrics, some with solar reflective backing, to suit all tastes and colour schemes.